Stores reference 10A/9004. Often referred to as the 'Microphone, mask, type E' (ref. 10A/9003) but technically that refers to the microphone complete with wiring and plug. 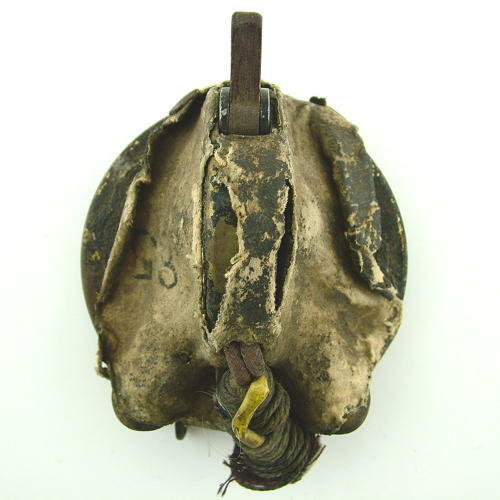 The microphone consists of a bell-shaped, chamois covered, black painted brass carrier. Within this the actual microphone componant is mounted (10A/7355). Part of the inside of the carrier is sprayed with powdered cork which acts as an insulator against condensation and noise. To the base of the carrier are two moulded breathing vents and there is a toggle switch at the top. This example is in quite good condition retaining much of its original chamois. The loose edges could be glued down in places providing even more coverage. There are remnants of the original wiring loom visible where it is bound to the wiring anchor bracket. These microphones were used with the cloth type D oxygen masks and pre-date the flat-fronted type 18 (type 19 when mounted/wired). Photographic evidence suggests they saw considerable use during the Battle of France and early part of the Battle of Britain. Fine looking microphone and quite a rare find. Stock code O16551.